Part 1: in which we demo our tools and test the waters with some strategy back testing. This prepares us for part 2 in which the grand, CPU cycle sucking, mini-strategy, battle royale will be run. In the last column we showed how we can visualize a market strategy. If you missed that column, here's a link to it. We're now getting ready to look at a larger number of relatively simple strategies, using back-testing. But first, let's get more familiar with the tools. A bit over a year ago, I wrote a program called etf-rank allowing me to rank ETFs according to arbitrary criteria. A model or "ranking function" which we hope is a good predictor of the target feature. By applying the predictor (a.k.a "model" or "ranking-function"), we hope to maximize the target feature (our goal) not just in the experimentation/learning phase, but also in real life. "if earnings-growth is over 15%, treat the ETF as a growth ETF and use Earnings-Growth divided by Price/Earnings (1/PEG) as the ranking function. Otherwise, treat the ETF as a value ETF, and use a combination of PE, PB, and Dividend-yield for ranking. Once the two groups have been ranked, normalize the two different ranges (growth and value) to the same scale and range, and finally pick the top N ranking ETFs for the portfolio." The value argument tells etf-rank to rank ETFs by value which is defined to be a geometric mean of the inverted weighted valuation ratios (PE, PS, PB, PCF) of the ETF holdings. The higher the "value", the better. "Building & Construction" is a totally different sector which has been doing well (think emerging countries buying Caterpillar heavy equipment) and should not be confused with U.S. Homebuilding. 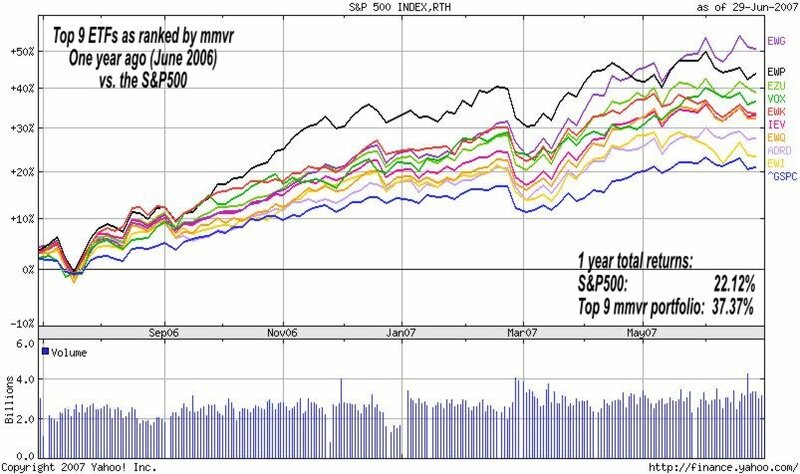 Q: Were the above top ranked 9 ETFs a good choice for investing a year ago (June 2006) when the value model suggested them as good holdings for a year? A: Yes, in fact, pretty good. 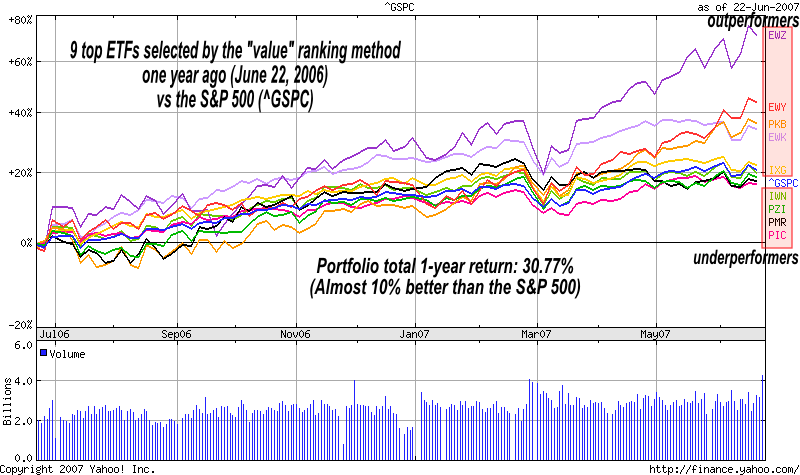 The S&P500 index had a very strong year with almost 22% return from June 22, 2006 to June 22, 2007. In this unusually strong year, it managed to beat 4 of the ETFs above (IWN,PZI,PMR,PIC) by about 0%-5%. On the other hand, the 5 remaining ETFs (EWZ,EWY,PKB,EWK,IXG) have beaten the index by a much larger margin on average as the chart shows, with the Brazil (EWZ) and South Korea (EWY) ETFs both returning over 70% and 40% respectively, for the trailing 12 months. This 'overall value' portfolio -- which is not actually our preferred strategy, let alone best strategy -- as selected one year ago, had returned 30.77%/year. Almost 10% above the S&P500 in a very good year for the S&P500. Plus, it did it with a good risk-adjusted monthly return (Sharpe-ratio 1.009) and while losing only 1.85% in its worst month (February 22 - March 22, 2007) out of 12 months. What if we didn't exclude the US homebuilders? The return would still have been 6% better than the S&P500: 27.18% for the same 1y year period, despite having one pretty obvious bad apple in the mix. The reason for mixing different ETFs is to avoid complete portfolio wreckage when we make errors. In investing, occasional errors are unavoidable. Q: What if we used a slighly more elaborate ranking function such as MMVR (Moderate momentum, Value, Risk) instead of pure value? A: Since MMVR looks beyond value, it is much more robust. For example, it automatically avoids blunders such as the "pure value" approach tripping on the US homebuilders. The Results of MMVR were much better: Total return, and risk-adjusted returns both show significant improvement. Here's a price chart of the top 9 ETFs as picked by MMVR one year ago, (9 + S&P500 = 10, only because that's the maximum number of tickers Yahoo! Finance allows on the same chart, it is also shifted by one week, just because I wrote this article over two weeks). And here's the best part: All 9 components have outperformed the S&P500. There wasn't even one underperformer! Here are the corresponding sanity-checks using etf-rank to pick the top 9 tickers a year ago, and using the portfolio-backtest program to summarize the portfolio performance over the year that followed. Again, the obligatory disclaimer: Nothing is guaranteed. Past performance is not necessarily indicative of future results. YMMV. In bear markets we will most certainly do much worse. Another caveat: picking the top N ETFs for a portfolio is not generally a good idea because the top N (for a small N) often tend to be highly correlated. In order to get diversification in a whole portfolio, we should pick low-correlated assets. I hope to be covering this in August and start publishing full model portfolios that have much lower risk than the "top N" strategy. Q: Nice backtest. Now what about the next 12 months? A: There are no guarantees. In fact, what we're seeing is so good that I'm almost certain it won't repeat. Especially if we hit some long overdue slowdown in the economy which is likely. In any case, the currently top-ranked ETFs by mmvr are listed in the next section. A year from now, we should be able to go back and back-test these rankings. Here are last Friday's rankings (top 40 ETFs among over 400). My advice if you want to buy any, would be to wait for dips. Look at their charts, and buy when the opportunity presents itself. Never chase even the best of the ETFs, especially when they trade at the upper half of their 'channel'. As always, I hope you found this column useful. Feedback, good or bad, is always more than welcome. Is there anything in particular you would like to ask that I can answer with my tools and data? Please don't be shy. Being able to start some future column with "a reader asks" would be neat.